WOW!!!! Never in my wildest dreams did I imagine that I would get a response such as the one that I did from my last post... Thank you all so very much! Your gorgeous and kind words have given me a much needed burst of life and a renewed love for my poor ol' blog... I do enjoy writing my posts and now that I know people are actually out there reading it and willing to comment I feel so much better... I am slowly, but surely, getting around to replying to each and every comment - I've loved reading them so once again - thank you very, very much!!! You know that big box of Orchard Fresh Pears that I was gifted back here??? Well, last week I turned them into the most amazing preserved goodness E V E R ! ! ! After the gorgeous Jane from Shady Baker emailed me a simple yet delicious recipe for poached pears I got to thinking..... This would be amazing if I could bottle it!!?? 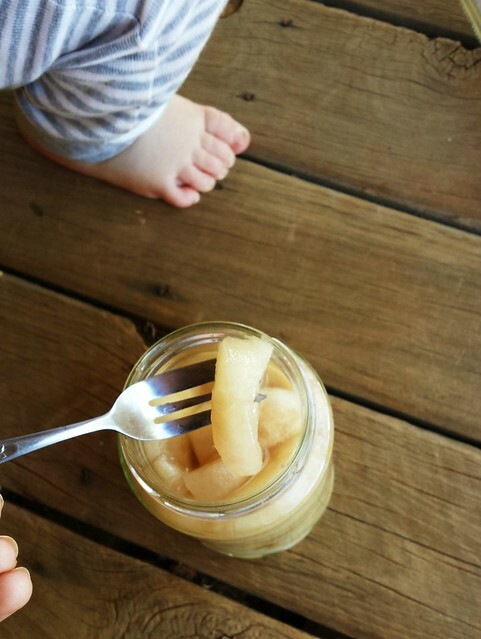 Then, after a day in the fridge they emerged as the most perfectly, sweet, crunchy, succulent pear segments. I think I can safely say they are the best I have ever tasted! We've been eating them straight from the fridge on their own, with fresh egg custard as a dessert, drizzled over creamy vanilla ice-cream - just because, and on my favourite breaky cakes too! But, you know who loves them most of all??? My littlest guy, Tobie! And for me that's a win-win, right!!! 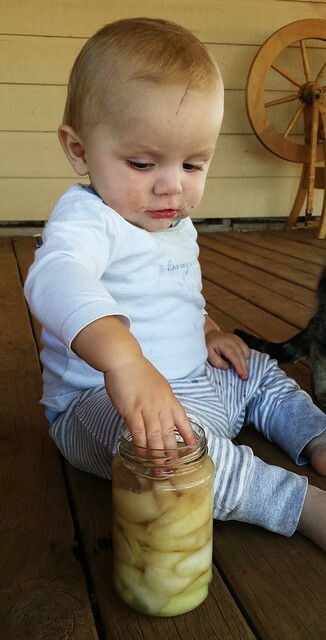 So..... Have you preserved anything this week?? Oh yum. Stewed pears and custard is favourite of mine. Pears never last very long here but I may have to try this if I can get some cheap at the farmers markets next time. Wow, Tobie looks so different in these photos!! I almost thought you were using a different model for these pictures!! 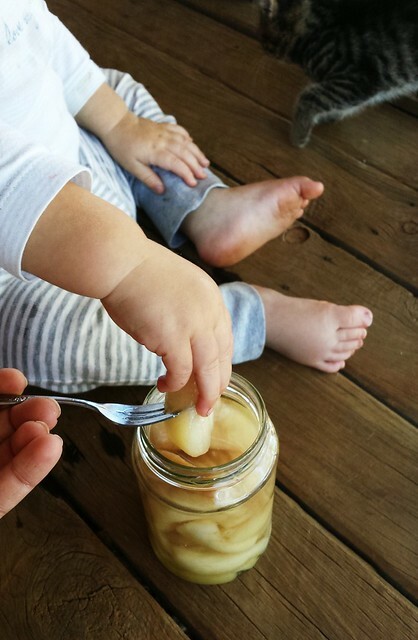 I'm such a sap - I'm still pureeing my stewed pears and apple for Alex an he's almost 17 months old!!! I love the idea of preserved pears with egg custard and on fresh muffins! So glad you wrote your previous post and you got the overwhelming response that you did. Now, get blogging .... and blogging .... and blogging!!!! 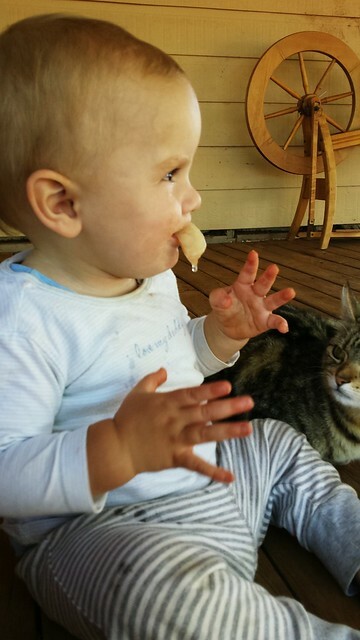 I love puréeing my apples and pears too Christine but lately Tobie has liked eating foods that he can 'hold-on-to'! 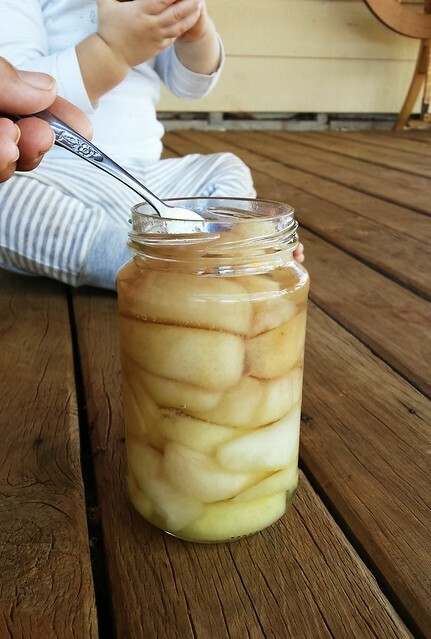 I've got some OK pears that aren't very exciting to eat, so maybe this is the answer. Will have to give it a try. Do Annie - it is simple yet super delicious!!! Would love to hear from you if you get the chance to make it..
Those look really yummy! Our pear season is over here in the states, so would have to buy some to make preserves. Thanks Darlene and you're so right, little people at this age are simply wonderful - a time to be treasured for sure.. This week I am making strawberry jam and green mango chutney and then when I get to it something with tomatoes, either relish or jam. Those pears do look good. 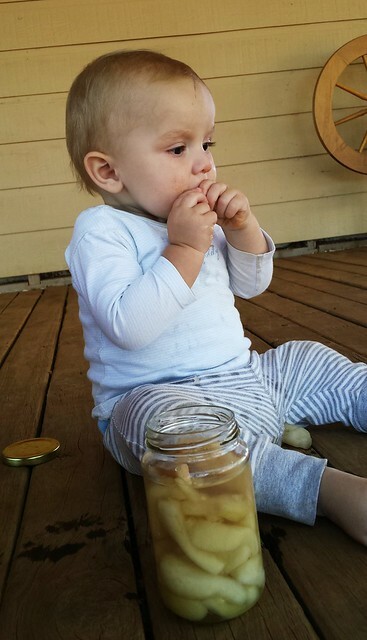 Yum - you are preserving up a storm at your place this week 'CountryMouse'... I look forward to seeing what you make with your tomatoes. I'm desperate for some fruit to ripen on my vines as I'm all out of tomato relish and can't wait to make some more.. They look great! If my pear trees actually bear fruit this year (last year they all mysteriously disappeared) I'll certainly have to give this a go!